I am co-teaching a class at Harvard Business School on entrepreneurship called "Launching Technology Ventures" along with my friend and colleague, Professor Tom Eisenmann. The class kicked off this week with two cases: Dropbox and Aardvark. As I reflect on the class discussions, one of the interesting tension points that arose is the challenge an entrepreneur faces in selecting their primary product design approach. Should they follow the Steve Blank, Customer Development Process school of product development or the Steve Jobs "vision" school? In other words, should they pursue a user-centric design paradigm — setting priorities based on rigorous tests and listening excercises that determine what users want — or should they pursue a more top-down approach akin to Steve Jobs, who famously said: "It is hard to design by focus groups because most of the time people don't know what they want until you show it to them. " 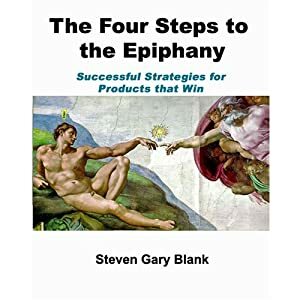 Steve Blank's book, Four Steps to the Epiphany, has become an instant classic in Start-Up Land for good reason. Along with the complimentary book by Eric Ries, The Lean StartUp, it provides an incredibly useful guide for starting companies, testing hypotheses and creating products that users love. Dropbox and Aardvark were terrific first case studies for the HBS students — both adhered to user-centric design principles quite religiously, but sprinkled a little founder vision in for good measure. In the case of Dropbox, founder Drew Houston was brilliant in developing an MVP (minimum viable product) that was no more than a simple prototype and then used a rudimentary online video to test user reactions to the prototype. Houston kept focusing on a test and learn approach to product development, event creating a "Votebox" feature that allowed users to vote for the product changes they wanted most. But Houston did not strictly follow the Blank/Ries paradigm religously. For example, after launch, he ignored the most requested feature that users asked for: enabling the service to synchronize files outside outside the Dropbox folder. In ignoring his customers' top request, Houston was exerting a Steve Jobs-like, top-down vision in order to stick with the focus on simplicity. In the case of Aardvark, a social search start-up that was later acquired by Google, co-founder Max Ventilla, was obsessed with following user-centric design principles. At one point in the case, Ventilla notes: "We were wary of relying too much on vision and intuition in developing a product." Yet at the same time, the company refused to provide an archiving capability in the early days of the product, focusing the service on a conversation paradigm rather than Quora's reference paradigm. Again, the insertion of a Jobs-like product vision. So in both cases, founders adhered to the Steve Blank school of product design, yet allowed their vision and instincts to overrule user feedback. What's going on? When should you choose between the two? First, I would observe that the dichotomy may not be as stark as it seems. Blank is careful to point out in his book that when a company first begins, "there is very limited customer input to a product specification." Therefore, "start development based on your initial vision." Yet, in both the Dropbox and Aardvark cases, the founders ignored their customers well into the development cycle. I would submit that there are two guiding principles that founders should use when considering overriding their users. First, when the feedback is in violation of a coherent set of product principles. In the case of Dropbox, this was an unwavering focus on simplicity. In the case of Aardvardk, a focus on social search being a conversation. Second, founders should only have the confidence to develop these principles and override their users when they possess very strong domain knowledge. When product-centric founders deeply understand their customer's viewpoint and have tremendous customer empathy, they have the right to make hunch-based product decisions rather than data-driven. Founders who override their users are betting on genius. Steve Jobs and Drew Houston have proven that genius pays off. But the attacks against Mitt Romney's record at Bain Capital – by both his Republican brethren and Democrats – and the demonization of the private equity industry are really starting to annoy me. I won't vote for him for president based on his policies and the policies of the party he represents, but I believe Mitt Romney's business track record at Bain Capital, and the private equity industry as a whole, is deserving of a full-throated defense. Second, the work of private equity is a healthy part of our capitalist system. Damning private equity as a maket force is absurd in a free market economy. Should bad, poorly managed companies be allowed to destroy value? Should fast-growing, innovative businesses receive capital and support to accelerate their growth? And should hard-working pensioners and retirees be allowed to invest their svaings in an asset class that outperforms nearly every other one available? Private equity has an important role and should be lauded, not lambasted. The WSJ does a nice job of making this case here. I'm not saying Romney, Bain Capital or private equity are perfect. I'm sure there were bad bets made or cases or situations where Bain Capital was overly aggressive in pulling out fees and, as a result, bankrupted the businesses they invested in, such as GS Industries. And Romney, as much good as Bain Capital does for investors, entrepreneurs and businesses, is a bit fast and loose with his soundbite claim of creating 100,000 net jobs at Bain Capital. Dan Primack of Fortune does a nice job of running through the fact and fiction behind the various claims here. I am tired of seeing politicians from both sides of the aisle talk out of both sides of their mouth. Capitalism is a force for good and we are counting on the capitalism system to enable us to grow our way out of this economic malaise by creating wealth and jobs, expanding free trade and innovation. So let's stop this name-calling nonsense (is Warren Buffet a corporate raider?) and instead focus on the important policy issues surrounding the economy, health care, foreign policy and social policies. That's why I'll vote for Obama for President again in 2012. Not because Mitt Romney is anything but a spectacular entrepreneur and business executive. Product Strategy: Stay Focused vs. Broaden the Footprint. The initial product is working well and now the question is how broad a product strategy should you pursue? If you think the total available market (TAM) for the existing product is large enough to satisfy yours and your investor's ambitions, stay focused. But, typically, the allure of pursuing the bigger win draws founders into ambitious efforts to broaden their product footprint through organic development efforts or even M&A. My partner, Chip Hazard, likes to refer to the broadening efforts as the "lilly pad strategy": focus on jumping on to a lillypad next to you rather than across the entire pond. By pursuing natural adjacencies, a company can increase its TAM – ideally by leveraging existing customers (meet their needs more broadly), channels (given them more things to sell) or products (extend the current prodcut footprint with natural adjacent add-ons). I'm often surprised that companies don't think through the basics of competitive strategy when evaluating these adjacent opportunities. At the risk of getting some eye rolls for evoking Michael Porter, I encourage start-up CEOs to think carefully about the new lilly pad's competitive intensity, entrance threats, threats of substitute products as well as the power of suppliers and customers when evaluating the adjacent opportunities. Financial Strategy: Exit vs. Raise Additional Capital. Once things are working well, there is a magnetic power that demands pouring more fuel onto the fire. If the customer acquisition costs (CAC) are proving out to be $1 and the customer's lifetime value (LTV) are $2, why not raise millions of dollars to acquire more customers? Obviously, it's not that easy a decision. Raising capital can be a hugely distracting, draining process and the dilution implications, as well as the choice of investors, has deep repercussions on your future options. On the other hand, pursuing an early exit can be appealing, particularly if the entrepreneur has never had a win before, but there are many difficult considerations here as well, which I touch on in a blog post (Walking Away From Liquidity) as does Roger Ehrenberg (To Sell or Not To Sell). Human Capital Strategy: Hire Grownups vs. Stay Young. There is a certain charm and many benefits to the founding team sticking together and scaling with the start-up. The culture remains true to the founding core, the young talented employees get growth opportunities, and there's an appeal to minimizing the disruption that outsiders bring. Yet, frequently, the talented founding team that gets you to the point of scaling is not the right team to lead the scaling process. I refer to the three stages of a start-up's life as "the jungle", "the dirt road" and "the highway". The team that is skilled at hacking its way through the jungle is often not as well-suited to accelerate rapidly once a dirt road has been discovered. Yet when more senior, experienced executives arrive, preserving the founding culture and maintaining alignment is critical. The best companies build teams for scale early on (e.g., hiring great VPs who can be both effective players and coaches as their department grows) and work hard to select for cultural fit (Google's top recruiter, Mike Junge, had a great interview on hiring best practices in PE Hub, "Why It Pays To Be Nice"). Founder's Dilemma: Bring in a Professional CEO? Ultimately, one of the biggest decisions a scaling young company makes is – who should be the CEO? The founder may be one of the uniquely talented individuals who can scale from the jungle all the way through the highway, but more often than not a senior, professional CEO is hired to help take the company to the next level. This decision is truly make or break. It rests on the founder's desires as well as the board's confidence in their ability to transition from a product-centric, pre product-market fit world to a sales and marketing execution-centric, post product-market-fit world. Investors would always prefer to see the founder make that transition, but if the skillset isn't there, having an orderly transition with open communication is key. HBS Professor Noam Wasserman has written a series of cases on this topic that show some of the do's and don'ts of navigating this transition. It's never an easy one to embark on. Each of these decisions can be gut-wrenching, bet the company moves. There's a nasty image I hear used in the board room about snatching defeat from the jaws of victory. If things are going well, you want to let them evolve naturally and achieve some measure of victory, albeit a small one. This may mean sticking with a founding leadership team, a niche product strategy and selling early. Why should each of these decisions sound limiting? Because great entrepreneurs are competitive, ambitious types who attract ambitious management teams, advisors and investors. There's a natural allure to moving aggressively to scale once the initial product-market fit assumptions become validated. Just scale wisely. Going from $1-10 million in revenue is no easier than achieving that initial $1 million. And getting to $100 million and beyond, well now you're really in the rarified air that gets the people around you excited – and sets expectations soaring higher.